For Joe Scully, the holidays are always a blur, and this year there’s even more frenzied activity for the lauded chef behind Corner Kitchen in Biltmore Village. Autumn marked the opening of Chestnut, his downtown restaurant with long-time business partner Kevin Westmoreland. If his life wasn’t hectic enough before, while churning out Southern-tinged dishes for folks who line up out the door for a table at his original establishment, it surely borders on madness now. But this inherently crazed season clearly suits Scully’s style. In the spacious basement kitchen of Chestnut on Biltmore Avenue, he’s a whirlwind—prepping, cooking, delegating, answering texts and calls, and all the while managing to crack jokes. This would be a typical nonstop day for Scully, except he’s also hosting an intimate gathering of friends at his latest venue to celebrate the holidays. So he pushes into overdrive, chopping, rolling, mincing, and sautéing with ease while sharing the story behind Chestnut. The availability of a prime downtown location across from the recently opened Aloft Hotel, with plenty of room to accommodate a catering kitchen, finally gave rise to a second venture for the business partners, who opened Corner Kitchen in 2004. The sleek space now bears no resemblance to its former incarnation as the übercasual Ed Boudreaux’s Bayou Bar-B-Que and home to Highland Brewing Company’s beer tanks. Today, simple, polished wood tabletops and a long bar warmly lit by low-hanging glass globes present an upscale but comfortable vibe. Tonight’s gathering will feature a purely relaxed menu, with Scully showcasing dishes from Chestnut’s evolving lineup, as well as finger foods, like the impossibly addictive Sugar Smack Bacon. As the chef coats one side of the thin pork strips with sugar, the granules glimmer in the light. “It’s like sequins for bacon—the new runway bacon,” Scully deadpans. Once they come out of the oven, he will stack the crisp strips like Lincoln Logs. “Just set them out on a plate and go,” he says. Scully quickly and skillfully plows through the rest of the preparations, creating Looking Glass Creamery goat cheese balls stuffed with grapes and rolled in toasted pistachio crumbs while tending the white wine, butter, and onions simmering with short-grain rice for the lobster risotto. For those arriving with a heartier appetite, oxtail strudel turnovers will be a savory treat along with a cocoa-rubbed Hickory Nut Gap Farms beef tenderloin. He’s prepared the oxtail filling for the turnovers in advance, and a quick browning in the oven turns the phyllo pockets into delicious golden gems. The multitasking and impending gathering remind Scully of childhood dinners—a big Irish-American brood sitting down to a formal meal every evening. His mother presented meticulously prepared dishes while his father “sallied forth with a Hamilton Beach carving knife in one hand and a martini in the other,” he recalls. Rather than martinis, the beverages of choice this evening will include Prosecco and Chestnut’s version of a classic Old Fashioned, a festive pinkish cocktail kissed with locally produced Troy & Sons Oak Reserve and Haw Creek Honey. As the party pals arrive and settle into an alcove near the front picture window, other dishes are presented for noshing, including a charcuterie plate with rich cheeses and Lusty Monk Mustard. Skewers of grilled mahi and Hickory Nut Gap Farms chorizo take an exotic turn on a bed of shaved pineapple. Passersby peek in at the conviviality of patrons and Scully’s guests in this urban holiday setting. 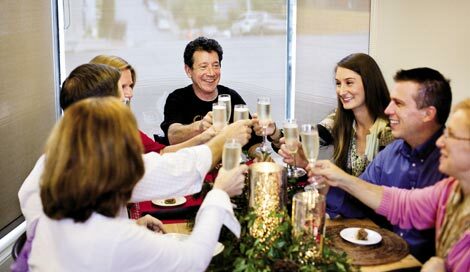 In the harried season when most hosts run themselves ragged, this veteran chef has been able to put in a full day on the job, and still find a few hours to enjoy some holiday cheer with friends amid flickering candlelight. Think Ahead: Make as many dishes in advance as possible so you can be a guest at your own party. Even basic prep work can save you time on the day of the event. Be Prepared: Have all your ingredients out and at-hand before cooking; it will save time and you won’t have to search for anything, or worse—run to the store mid-cooking session. Make it Easy: You don’t have to make everything the hard way. For instance, if you don’t have time to make the phyllo for oxtail turnovers, there’s no shame in using premade dough. Let the Food Shine: Simple dinnerware puts the focus on the food. At Chestnut, Scully uses plain, white dinner plates. Get Help: Hire a bartender or assistant to help clear plates and wash dishes.